This chapter aims at presenting the algorithms for point clustering feature generalization. For this purpose, it firstly defines and describes the relevant concepts (Sect. 2.1) and illustrates the types of point clustering features on maps (Sect. 2.2), and analyzes the approaches for describing point clustering features (Sect. 2.3). After this, it presents and analyzes the existing algorithms (Sects. 2.4 and 2.5). Last, the chapter is ended by a concluding summary (Sect. 2.6). Burghardt, D., Purves, R., Edwards, A., 2004. 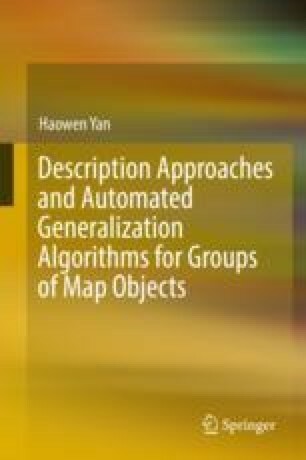 Techniques for on the-fly generalization of thematic point data using hierarchical data structures. In: Proceedings of the GIS Research UK 12th Annual Conference, Norwich, UK. http://www.geo.unizh.ch/_burg/literatur/gisruk_draft.pdf.